Groundwater occurs beneath the earth’s surface in the spaces between soil particles and between the mineral grains that form rocks. According to the U.S. Geological Survey, about 25 percent of the freshwater used in the United States comes from groundwater sources. The other 75 percent comes from surface water. Groundwater is especially important in the arid West where surface water is not as ample as in other parts of the country. Groundwater uses range from providing a freshwater drinking supply to irrigating crops. The majority of groundwater comes from freshwater aquifers. Usable quantities of water are obtained from these water-saturated soils and rocks through wells or springs. Alluvial and glacial sediments composed of silt, sand, and gravel, as well as porous sedimentary bedrock formations of sandstone and limestone, make up most of the world’s aquifers. Although groundwater can be found in most places on earth, much of it may be unsuitable for drinking due to poor water quality or low rates of production. The spatial occurrence, production characteristics, and groundwater quality of an aquifer is controlled by the presence of a water source, or recharge, and the stratigraphic and structural settings of the local geologic formations. In most cases, groundwater is recharged from precipitation that has infiltrated through the ground surface and into the aquifers. Aquifers can be confined above and/or below by layers of clay, shale, or unfractured granite. These materials typically allow groundwater to flow so slowly that they effectively act as barriers to flow or aquitards. Although aquitards may store large amounts of groundwater, their low flow does not allow water to be produced from a well at rates sufficient for most uses. Alluvial and shallow bedrock aquifers produce most of Wyoming’s groundwater. Groundwater is recharged naturally by rain and snowmelt. This precipitation plays a key role in replenishing groundwater resources under the earth’s surface. This hydrologic process involves water moving downward from surface water to groundwater. Recharge for Wyoming’s aquifers originates largely as rainfall or snowpack in the state’s mountain ranges. During snowmelt in late spring and early summer, the water released infiltrates the ground surface to recharge underlying aquifers or it turns into runoff that contributes to stream and river flows. Wyoming’s semi-arid basins, characterized by low precipitation, high evaporation, and reduced soil permeability, generally provide much less recharge to its aquifers. The state’s alluvial aquifers interact closely with associated surface water flows. In high mountain catchments, groundwater contributes to streamflow when it is discharged from springs and seeps along “gaining” stream reaches. Further downstream, the flow of water may be reversed and the stream may recharge an associated alluvial aquifer in a “losing” reach. In many cases, gaining and losing reaches alternate along the same streambed depending on the relative elevations of groundwater and streamflow and local geologic conditions. Bedrock aquifers receive recharge at their outcrops on the basin margins from direct precipitation and infiltrating streamflows. The state’s shallow bedrock aquifers produce freshwater close to their recharge areas. Frequently, the same aquifer produces oil and gas from petroleum reservoirs deeper in the basins where the groundwater is more saline and unsuitable for drinking and agriculture. 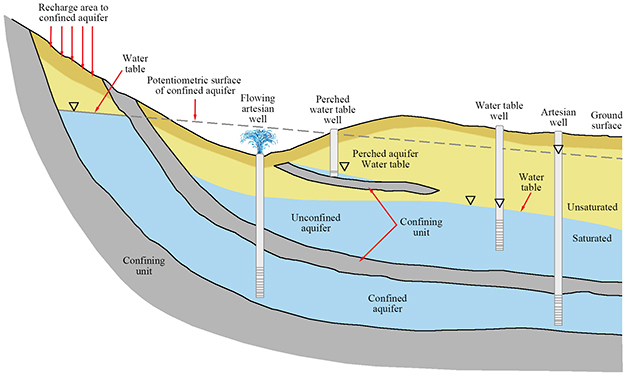 Wells that draw from the shallow margin bedrock aquifers can be artesian, flowing artesian, or water table wells. Online water and climate data for Wyoming, and links to drought and snowpack data. Sponsored by the Wyoming Water Development Commission. Agency information, Wyoming Water Planning Program, research projects and funding, publications, water development projects, and public comment. Groundwater regulations, forms, water well construction requirements, monitoring network information, surface water information and data, and water rights data. Data, programs and publications on groundwater, aquifers and wells; Information on quality of water resources, and USGS water science glossary and hydrologic definitions. Employment, geospatial resources, software, earth science resources, weather and climate data, and environmental science equipment. Website for groundwater professionals, professional services and resources, research and journal publications, advocacy, and educational and public service information. The use of Wyoming’s water is managed by the Wyoming State Engineer’s Office. The Wyoming Department of Environmental Quality monitors water quality. 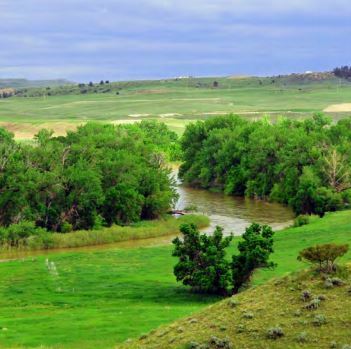 These agencies serve important roles in the management of Wyoming’s water resources. Any events–changes in climate, drought, vegetation change, fires, insect outbreaks–that impact our mountain watersheds will have major consequences for all Wyoming water users and water users downstream. Wyoming is the fifth driest state in the United States. More than 70 percent of the state receives less than 16 inches of precipitation on average each year. At 6,700 feet, Wyoming also has the second highest mean elevation in the United States. Mountain snowpack runs off to form the headwaters of Wyoming’s major river systems and helps recharge aquifer systems. Three of America's major river systems have their headwaters in Wyoming: the Missouri, Colorado, and Columbia. Other major rivers include the Yellowstone, Bighorn, North Platte, Green, and Snake. 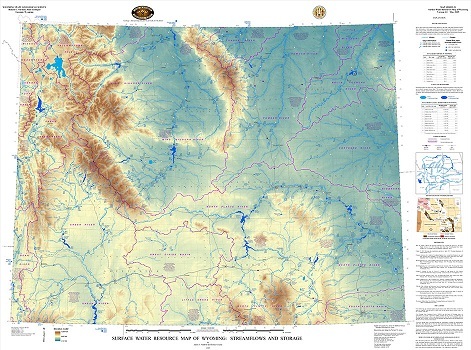 The Wyoming State Geological Survey in 2009 released Surface Water Resource Map of Wyoming: Streamflows and Storage showing streamflows and surface water storage in Wyoming. This unique and comprehensive map product includes current and historic streamflow and reservoir capacity data. The map is available as a free download or for purchase in hardcopy with accompanying CD that illustrates the minimum, average, and maximum streamflow rates at 330 U.S. Geological Survey gage locations across Wyoming and the maximum storage capacities of reservoirs and volumes of major lakes. 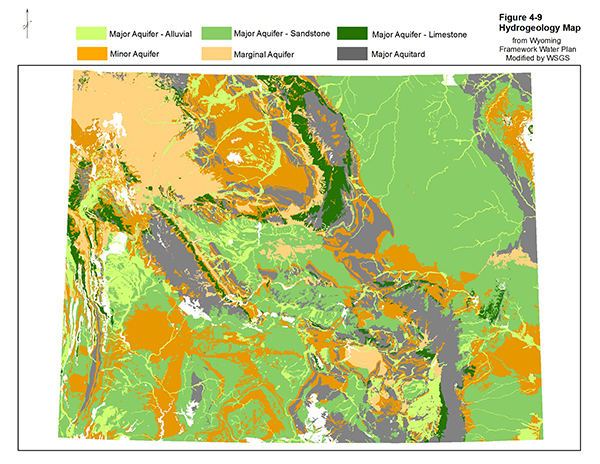 The map also features watershed boundaries, surface water facts and trivia, tables of the 10 largest lakes and rivers, and inset maps of structural geology and the headwaters and routes of Wyoming rivers. View the Interactive Wyoming Groundwater Atlas with ArcGIS Online. Publications about Wyoming's groundwater can be downloaded from the WSGS Product Catalog. A report on the salinity of groundwater in the Powder River Basin. A report on the occurrence of sinkholes and other evaporite-related karst features in the southern Laramie Basin, including in and around the city of Laramie. This updated report presents data from Bureau of Land Management’s (BLM) deep monitoring well network in the Wyoming Powder River Basin along with initial interpretations. This data was collected from the monitor system through 2013. This updated version includes more complete individual monitor well reports as well as comparisons to CBNG well production within a 1.5-mile radius of influence. This publication includes a discussion on the geologic setting of the Powder River Basin as well as coalbed hydraulic properties and recharge. The study also includes results from individual water monitoring well sites with full-color figures and maps. A report on groundwater salinity in the Denver-Julesburg Basin of southeastern Wyoming. This report examines the salinity of groundwaters that occur at depths of 5,000 ft or less in the Denver-Julesburg structural basin where significant oil and gas activity has taken place in recent years. A statewide groundwater study using a new model to estimate baseflow, a significant component of groundwater recharge. A report on groundwater level responses to coalbed natural gas (CBNG) production in the Upper Wyodak coal zone. Data for this study covers the last four decades and was obtained from the BLM monitoring well network program for the Powder River Basin. Available in the Water Section of the WSGS Product Catalog.